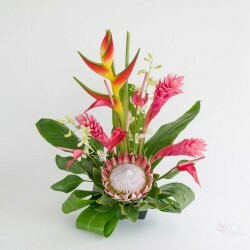 Makana Aloha is a gift of ‘Aloha’. 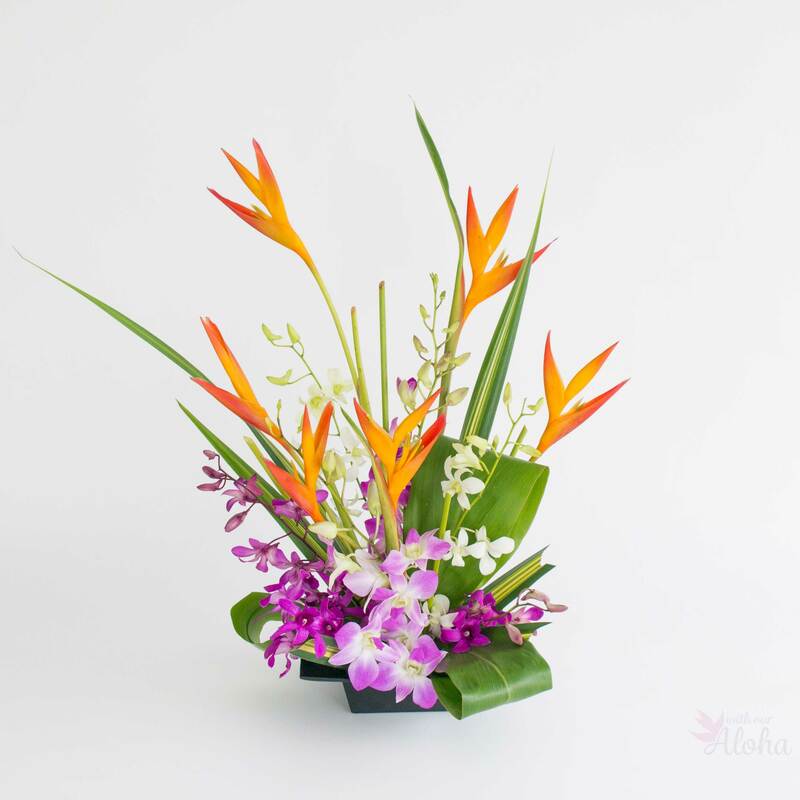 A simple yet beautiful selection of Hawaiian flowers. 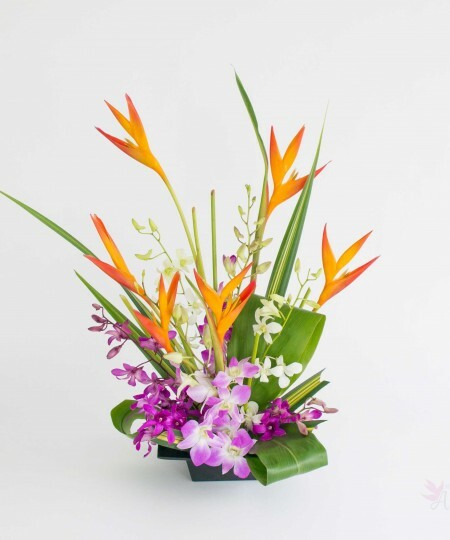 We combine tropic fleur heliconia and dendrobium orchid sprays. 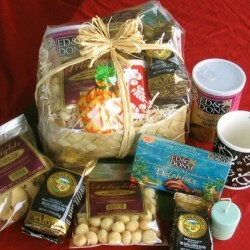 ‘Makana’ is the Hawaiian word for gift. 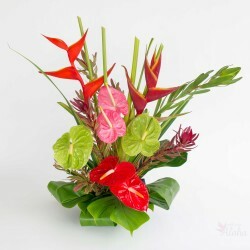 When you send Hawaiian flowers you are sending your special feeling of Aloha. That can be an expression of love for a family member. It can also be an expression of gratitude to a colleague. 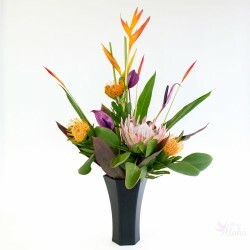 This is a tall flower with a gold and orange bloom. The inflorescence is actually a set of 5 or 6 bracts. 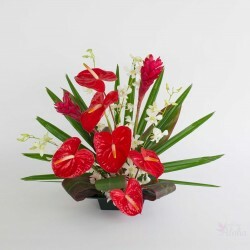 The flowers within produce a nectar prized by birds including hummingbirds. 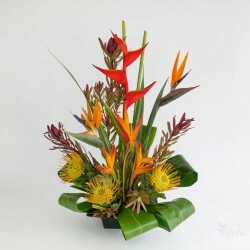 They bear a slight resemblance to bird of paradise flowers. Though they do not open so dramatically as birds. 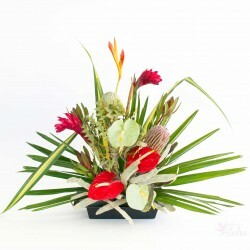 The color is also different being a creamy orange with red at the tips. 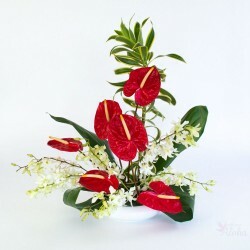 Orchids are a quintessential Hawaiian flower. The cut sprays are eighteen to twenty four inches with several blooms on each. The buds toward the tip of the stem open last. 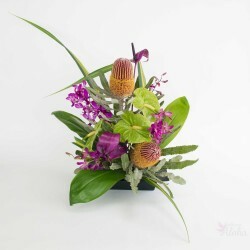 We include a mix of colors including lavender, purple and white. 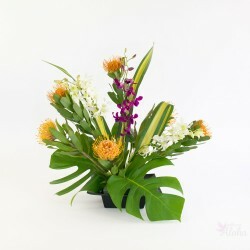 We complete the ‘Makana Aloha’ tropical flowers with two favorite Hawaiian leaves. Ti leaf is wide and long in a deep green color. Hala leaf is long and more narrow, ending in a point. Hala leaf is green with yellow running down the center of the leaf. These all arrive as fresh, full length stems ready to be arranged. 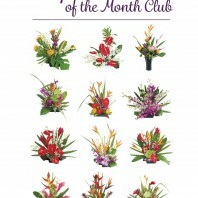 This is our Flowers of the Month selection for August.